Click here to view an animated version of this test. An upper GI endoscopy is a test that allows the doctor to see inside the body. It is used to look at the throat, esophagus, and stomach. The upper part of the small intestines may also be examined. Your doctor may instruct you to take antibiotics. Arrange for a ride home after the test. Also, arrange for help at home. The night before, eat a light meal. Do not eat or drink anything for 6-10 hours before the test. Talk to your doctor about any medicine you are taking. You may need to stop taking some medicine up to one week before the procedure. You may be asked to lie on your left side. Monitors will track your breathing and heart rate. A tube may also be placed under your nose to provide extra oxygen. A special mouthpiece will help keep your mouth open. During the test, a small suction tube will clear saliva and fluids from your mouth. The endoscope is a long tube with a light and camera at the end of it. A lotion will be placed on the tube to help it move easier through the digestive tract. The doctor will place the tube in your mouth. You will be asked to try to swallow it. The doctor will carefully and slowly continue to pass the tube down the tract. A nearby screen will show images of the tract as the tube is passing through. Air may be passed through the scope. The air can press open the tract and smooth the normal folds in the tissues. This will make it easier to see the tract. Special tools may be passed through the tube. They can be used to take a sample of tissue for testing or do other procedures. After the test, you will be observed for an hour. Then, you will be able to go home. Do not drive or use heavy machines for the rest of the day. Avoid alcohol for the rest of the day. Do not make any life-changing decisions. Do not sign legal documents. You will have discomfort during the test. Your throat will be sore. The air that is used can also make you feel bloated. This should pass over the next couple of days. You and your doctor will talk about the results. It may help to explain your symptoms or just rule out other conditions. Davila M, Keeffe E. Complications of Upper Endoscopy. In: Feldman M, Friedman L, Sleisenger M. Sleisenger & Fordtran's Gastrointestinal and Liver Disease. 7th ed. Philadelphia, PA: Saunders; 2002:539-543. 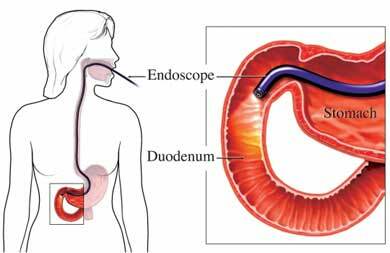 Understanding upper endoscopy. American Society for Gastrointestinal Endoscopy website. Available at: https://www.asge.org/list-pages/patient-informations/understanding-upper-endoscopy. Accessed October 3, 2017. Upper GI endoscopy. National Institute of Diabetes and Digestive and Kidney Diseases website. Available at: https://www.niddk.nih.gov/health-information/diagnostic-tests/upper-gi-endoscopy. Updated July 2017. Accessed October 3, 2017.